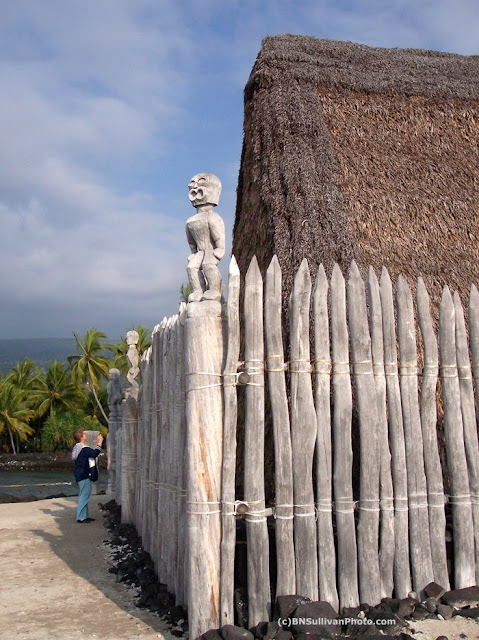 On the southwestern coast of Hawaii's Big Island is the Pu'uhonua o Honaunau National Historical Park. Pu'uhonua o Honaunau, also known as the Place of Refuge, is a sacred place of great historical significance in the Hawaiian culture. Situated in the South Kona district, this is a 'must see' for visitors to the island. This photo shows a structure on the park grounds called the Hale o Keawe heiau (Hawaiian temple). A half-sized reconstruction of the original heiau, it is constructed in the traditional manner. It has a frame made of 'ohi'a wood tied with coconut fiber, and a thatched roof made from dried ti leaves. The original Hale o Keawe heiau housed the bones of deceased Hawaiian chiefs. Update: Here is a close-up photo of a ki'i -- the wooden figures that guard the heiau.